The most satisfactory device yet found for doing quarter, half and full squats -- for doing Hise Shoulder Shrugs and other heavy poundage exercises where weight is held on shoulders. It has made squatting a pleasure by removing the agonizing and sometimes paralyzing pain and discomfort of a heavy bar across the shoulders cutting into the flesh and putting pressure o the spine. 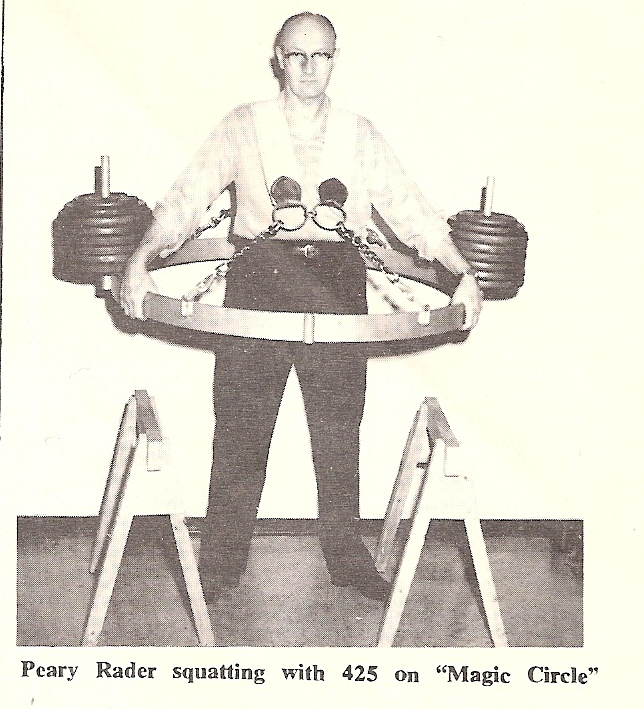 The "Magic Circle" gives a freedom for deep breathing in the popular and result-producing "Breathing Squats" for the exerciser can stand erect and breathe normally with a high lift of the chest at every breath, and is not compelled to hump over forward and breathes it the abdominal area as with a bar. In use, the "Magic Circle" is loaded up on the side pegs (unless you go over 700 lbs., in which case you have front and back pegs to load on), step in the circle (which is supported on side horses or boxes), lift shoulder straps onto shoulders, center straps, stand erect and walk away from stand and begin squats in normal manner. When finished, walk back to stands and lower ring to supporting rack. While squatting it helps to grasp ring in front and pull slightly toward you. If you get stuck at bottom you place hands on legs and push upward to recover. No more getting stuck at bottom 1200 lbs. or more. Priced at only $44.50 f.o.b. Alliance, Nebraska 69301. -- No C.O.D. please. Editor's note -- do NOT try to purchase the above item as this is just a re-printed ad from an old 1971 Iron Man Magazine for entertainment purposes only. This item is no longer manufactured anywhere in the world.